Editor's Note: Welcome to part 2 of Promoting Wisteria Bloom. This article offers a three-year plan for pruning your wisteria for health, structure, and bloom, whether it is newly planted or already established. It therefore offers detailed, step-by-step information on intermediate and advanced pruning techniques. Not everyone will want to tackle wisteria care at this level and that is okay! For general care guidelines and advice on helping your wisteria thrive and bloom, refer to Promoting Wisteria Bloom, Part 1. 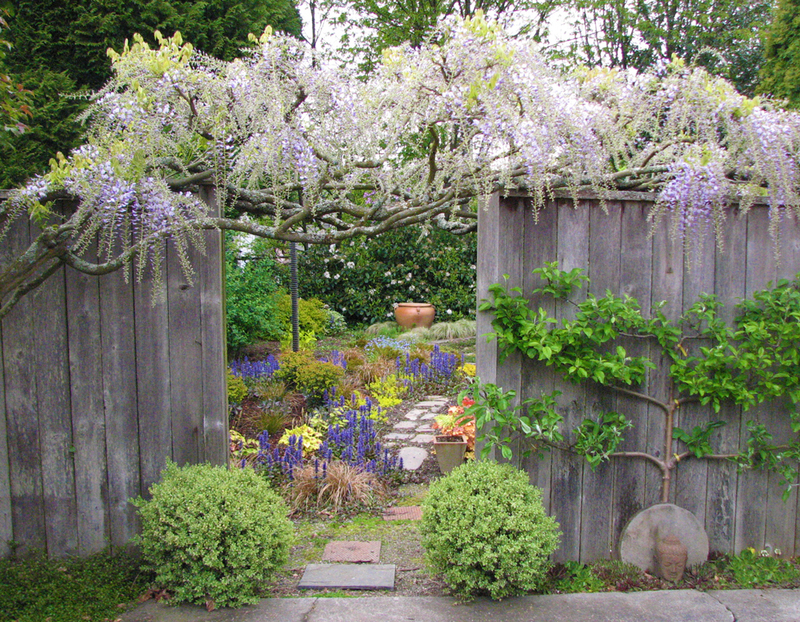 Proper pruning can help you manage a wisteria and produce a truly spectacular flower show. At a minimum, pruning should be done twice a year: once around mid-summer (a few months after flowering) and again in late winter/early spring (before the plant leafs out). Ideally, these two pruning sessions should be supplemented by routine thinning throughout the growing season to prevent congested growth and/or to continue training the plant along a structure. Doing this will not only make winter pruning a quicker operation but can help reveal wisteria’s beautifully gnarled and twisted trunks. Wisteria performs best with a clear basic structure. Think of this as the "armature" or framework from which flowering growth occurs. Regardless of whether it has been espaliered, trained as a standard (a free-standing tree form), along a porch, over an arbor, or in any other form, the principles remain the same with only small nuances here and there. And while it is easier to train a young plant, the rules remain the same for even ancient wisteria vines. For the sake of this piece, I'll assume our hypothetical wisteria is espaliered against a wall, but these rules can be directly extrapolated to any other growing circumstance. Deducing a vine's structure, as well as where it flowers and where it doesn't, will help reveal where to make cuts. Primary leader: the primary leader is the main vertical element of the plant. Often, in older plants, the primary leader branches off to form several leaders. Side shoots: any branch that grows from the leader. Some side shoots will be selected to become laterals; others should be removed as needed to minimize congestion. Secondary branches (laterals): these are side shoots which grow from the leader and are tied in to create the strong secondary branches of the plant. Tertiary laterals: side shoots that grow from the laterals. Some of these develop into flowering spurs (short side shoots where flower buds typically develop). Understanding the different bud shapes is also important: flowering buds are rounded and more swollen, whereas leaf buds are more narrow and pointed. In the picture below the larger buds are flower buds and the small, pointy buds are leaf buds. Once your wisteria is planted considering cutting the primary leader back to a strong leaf bud, roughly 3 feet from the ground. Next, remove any excessive side shoots to help stimulate the growth of a strong leader. Tie in your new leader, then select some strong side shoots and tie them in at an appropriate angle (~45 degrees). These shoots will become your lateral branches. As they grow, cut them back to 3-4 leaf buds. This will encourage the formation of flowering spurs for future seasons. No matter when you planted your wisteria, after its first full growing season, revisit your plant the next winter, when it is bare of leaves and flowers. Ideally, choose a sunny or dry day (if we're lucky enough to have one!) to perform winter pruning. Cut back the leader again to between 2-3 feet above the highest lateral branch. Cut lateral branches back by about 1/3 to a strong leaf bud. Cut tertiary side shoot back to encourage flowering spurs. The first year can be frustrating; cutting back hard and keeping your new plant relatively diminutive can seem counter-intuitive. But this is absolutely essential to developing a strong framework and a good set of flowering spurs. And now we're in year 2! Continue tying and guiding your primary leader (it is OK to have two leaders if it makes sense for your situation). As your leader grows, select a second (and/or third) set of shoots to grow as lateral branches and tie them in roughly parallel to the first set of laterals from the previous season. At this point you may be seeing basal growth—young shoots exploding from the base. Remove them immediately and continuously with a clean and flush cut against the trunk. If they are popping up near the base of the trunk directly, either lightly cut them with a spade or dig around them a little bit and cut beneath the soil surface. Strong tertiary shoots growing from the lateral branches that may be growing quickly out of the structure you have created should also be removed. Monitor the plant through the summer of Year 2 to keep unwanted growth at a minimum until you start to reach the allotted space for the plant. Once your plant is well established (from year 3 onwards), continue the practices outlined above. In summer, about two months or so after flowering, cut back most of this year's side shoots to 5-6 buds. In winter, cut these same branches back even farther to 2-3 buds of their base. This will help produce the coming season's flowers. You may also prune any leaders back by about a third if the wisteria has reached the desired height. This helps to not only manage overall size, but helps to ensure that the wood stays strong and tidy instead of weak and sprawling. If you're dealing with an older and overgrown wisteria, thin it out heavily in the summer but try to keep major cuts (around two-fingers-to-wrist width) to a minimum as these are best performed in the winter. Wintertime is often the best time to inspect older and unmaintained specimens for structure and possibilities. Using the principles outlined above you can slowly train a wisteria back into a controlled and free-flowering form. Note: Wisterias can withstand heavy renovation pruning but this may delay flowering for a year or two. Don't worry, your wisteria will eventually flower again. If you're doing construction around a wisteria and have to remove it entirely, cut it at the base and avoid soil compaction around the trunk. Quite frequently new shoots will come up from the old root system if the plant was very vigorous. Again, it will be some time before it begins flowering again, but the established root system can aid in a relatively quick recovery. Wisteria can be a hugely rewarding plant capable of enormous presence in the garden, but it does require some work. 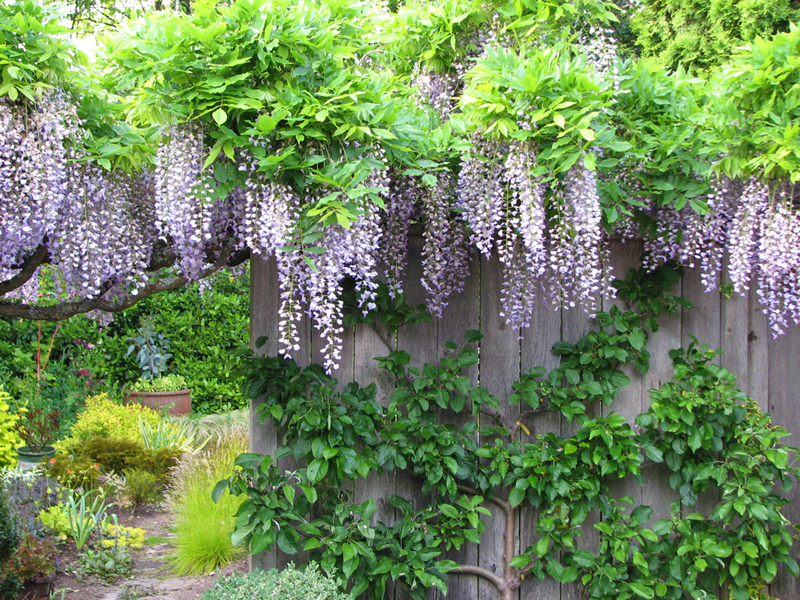 However, as the years go on and you begin to keenly understand your plant’s structure, pruning will become quicker and more intuitive, and given wisteria's capacity for immense growth, the possibilities for training it into unique forms or over structures will create a real treasure in the garden to be enjoyed for years and years.